Back at home, the cook just added some salt and pepper to the tiny fish fillets, some egg yolks (leftover from the pavlova experiments) and some cornstarch (you can use flour instead) and fried these up in some vegetable oil in little patties roughly 3 inches in diameter. The eggs and flour acted as a binder for the fish fillets and it fried up crisp on the edges and a bit chewy in the middle. 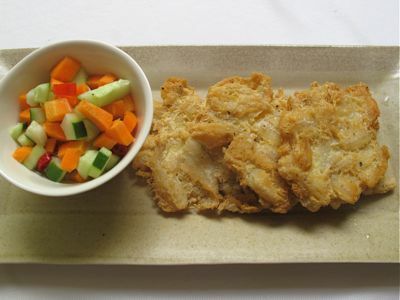 I served these with a hastily made Indonesian style acar or mixed pickle by cubing some cucumbers and carrots, adding sliced chillies and dressing it with a vinegar, water, sugar, salt and pepper mixture. The acidity and sweetness of the instant pickle was a nice foil for the fried fish cake of sorts. P.S. If you have a better idea what these particular fish are called, kindly leave me a comment. Thanks! Sorry, MM, I’m just as stumped as you, but this does look yummy. 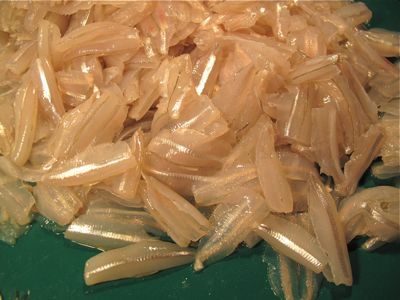 if i’m not mistaken when i buy that in asian shops here, it is called white bait.. (here: means land down under).. those are yummt. i also make that into torta. instead of cornstarch i used flour and add some minced garlic to make it more delish plus lot of cracked pepper. we usually dip that in vinegar with garlic and sili for the zing… definitely a winner in terms of taste but not price. (costly here, more than the price of minced beef and pork per kilo). cheers! Could it be silverside fish? Silver side are close relatives of anchovies…it closely resembles them though not at all the same as Silver Fish…confusing? MC: I saw this at the Asian store and sold frozen in 1 pound boxes. I almost bought 1 box and make it into something like Dulong in Olive Oil. It costs a lot cheaper than the White Bait from Japan. I think, MM , what you have there would be a good sub for Dulong if you want to try making the Dulong in Olive Oil. In Bacolod we call this fillets “nipis” which means thinly sliced. I think this is from “Bolinao” or a big transparent type of “dilis” fish something. Now how’s that for a very scientific description. They look like baby asuhos fillets. My mom used to served this for lunch then the leftovers will be for merienda..tortang dilis burger! just some hot pandesal with mayo and ketchup! Here is a so-so description, MM…not as scientific as Lee’s! I could be mistaken but I think it is a LONGFIN SILVERSIDE to be more specific. There are about 35 genus of Silversides. This particular Silverside has 2 dorsal fins and a really long pectoral fin. I am no marine biologist, Lee! My niece’s son is into fish!!!! To the binder, I add a little bit of milk, minced green onions and a touch of crab/ shrimp seasoning (seafood spice) and more paprika for color.The grandkids love it. I am from Iloilo and we call them bolinaw, just as Lee stated. We like to make kinilaw with them, especially the bigger ones. I think you are correct, they are the ones dried and become dilis. 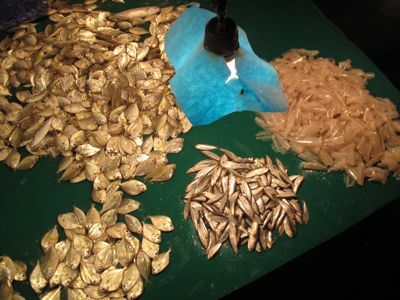 The other fish that may be confused with bolinaw, and which is also dried is the tawilis-type fish that is between the bolinaw and the small sapsap in the photo above. I think this is anchovy, and it is really this type of fish that is salted and ooze out a thick liquid called anchovy sauce. It’s called Bolinao here in Cebu. My mom used to cook them as soup with malunggay. Yes-it’s bolinao in Cebu. Our cook uses it for inan-unan–wrapped in some leaves and boiled with some ginger, garlic and vinegar. Yummy for breakfast with some scrambled eggs! the market vendors call them “first-class dilis”, while my mom calls them “twakang”. love them. yep, Lee is right… we call this “nipis” in Bacolod, and the slightly bigger version is great in kilawin, though preparation [meaning, deboning] can be a real pain. Whoa!! Lee woke up and became a scientificalist! You’re one funny dude, Lee! We get a similar fish here in Norcal. It’s called smelt. Battered and fried, I call it PoChips. We eat it whole, eyes and all! ConnieC: What is seafood spice? You just made that up, didn’t you? Please tell me more. We know it as “twakang”.Sometimes the fish vendor is lazy to remove the bones but when they are not too busy they do it so that’s the only time I buy this fish.I fry it individually after dipping in flour-egg-bread crumbs.Yummy! I eat it with toyo-suka-sibuyas mixture.My sister use it too for kinilaw. Sounds crispy and delicious. Thanks BettyQ for the tip. I will keep my eyes open for this. Silly Lolo, I believe the seafood spice Connie C referred to is the “Old Bay Seasoning” that comes in a tin can. I bet you the Golden Gate Bridge and her panoramic residential area Sausalito with you for nothing that you are very familiar with Old Bay Seasoning. Silly Lolo, no I did not make it up. Maria Clara is right, it has the same ingredients as Old Bay seasoning, only we get it freshly prepared at the seafood market. It is used to season freshly steamed crabs or shrimps and is much better than the spice mix from the jar or can. BTW, smelts, are not quite the same as dilis MM featured here. The small smelts are still much bigger than the dilis but you can cook them the same way. had to check his post of an ilonggo blogger for confirmation..it is a pain in the neck to debone. probably why vendors already do the job. Balantiong is also delicious for kinilaw. Silly Lolo: Seafood seasoning for CLAMBAKE!!! Dungeness crab (steamed), snow crab legs, King Crab legs, spotted prawns (steamed), clams and mussels. oysters, steamed New potaoes, and corn! Dust with seafood seasoning! Oh, don’t forget the smoked sausage too! 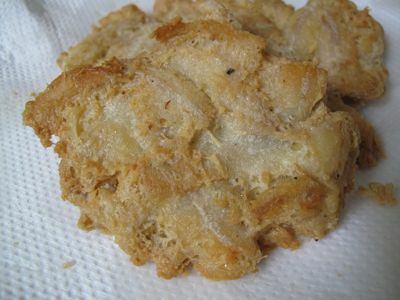 Connie C.: try using TEMPURA batter next time but not swimming in it. I add julienned green onions, paper thin sliced sweetonions, and atsuete for color. it is one crispy “nipis” okoy! Dip in SINAMAK!!!! I love eating this tapas style, ceviche in olive oil. *mouth waters with the thought* What do they call these again in their menus? Is it boquerones? bettyq; Thanks, always a welcome tip. Will try it next time. what is sinamak? Doc…sinamak aged vinegar with sili labuyo and ginger and garlic…Mimi posted her recipe for it under the Breakfast of champions post (the one with the dilis). MC: I used part of it together with the other suka…for your Gourmet Dilis….masaaaaarap! Found the Japanese Dilis in Chinatown….costs a bit more but would rather use that instead of the bleached ones from China! My wife who comes from bicol said they thumb the flesh off the bones to get the flakes, and make kinilaw. I prefer the fritters done by MM but at bite-sizes so you eat like a popcorn. Great finger food – perfect with the pickled veggies! i think it is also called “gurayan” here in bacolod. paolo and ntgerald:gurayan is also good for pinamalhan. is it also called ‘guno’?? These are dilis for kinilaw. 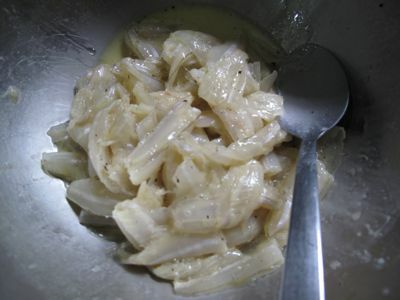 (My Dad was Ilonggo so we used to do this at home-vinegar,salt,pepper,bit ginger,onions and green pepper.) Better to get them really fresh with the “bones”. Towards noon,when they’re not yet sold,the vendors debone them so they will get sold right away. And really cheap. Guess they’re okay to make them into fillets,but if you want really fresh ones for kinilaw,buy early in the morning and get the ones with “bones” and patiently debone. Got this info from a market suki-a long time ago–so I always buy those with bones when I need some for kinilaw.I rarely buy as it is sooo labor intensive (deboning). Marisse: if you have a filleting knife, it is not as labour intensive as others might think. In one swift motion, you can fillet any fish. My native friends are quite impressed at how I fillet my salmon that I have to show them. They are fishermen since time immemorial so I would think they are the experts. Of course, since I was a little girl, I took delight in watching the seafood vendors at the palengke do this. Downside to knowing this…my siblings usually end up asking me to gut their salmon and prep it for them. So I usually tell them…maybe they would like me to cook it for them as well?!? Natie, thanks for the useful link. I miss home just looking at those fish and the names — in Ilonggo pa! i agree with honey. we call it silag in bicol. in some parts of sorsogon it is called lipatang. the smaller ones are perfect for okoy but the bigger ones are best for kinilaw. bolinao is different. bolinaw in cebuano, dilis in tagalog. but i think it is the bigger variety. my parents would have this inun-unan style wrapped in banana leaves. sometimes a cousin would make it into kinilaw. left over kinilaw would either be fried or picked and made into torta. hello ms.marisse n bettyq. good to read yourposts again. :)ang tagal kong nawala uli. dilis blanco in Zamboanga, this is called. usually made into torta as well, but also often made into kinilaw or paksiw.